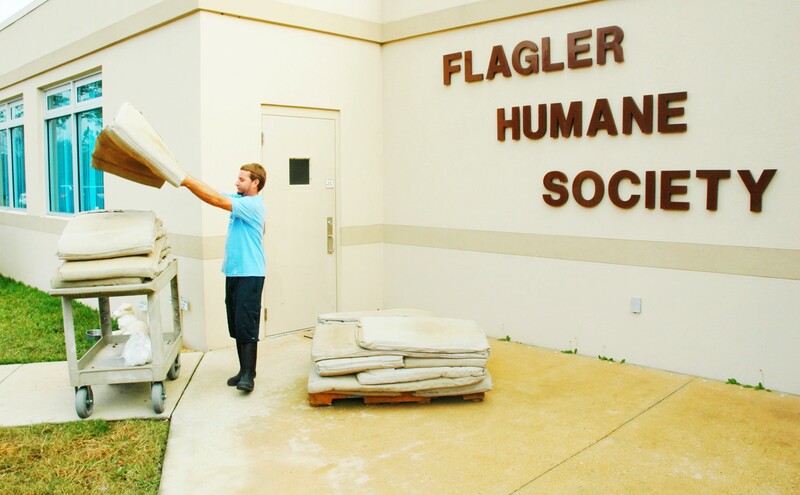 Hammock Beach Resort’s Green Team donated more than 100 lounge chair cushions to the feline residents of the Flagler Humane Society this past Tuesday. The once poolside lounge chair cushions have been repurposed to be cushions for the comfort of the cats at Flagler Humane Society. The Hammock Beach Resort Green Team also donated food, toys and other items for the animals at the Flagler Humane Society. Comprised of Hammock Beach Resort employees, the Green Team was established in 2008 to help the resort reduce waste and also contribute in the continuous efforts to keep Flagler County environmentally healthy. In addition to environmental contributions, The Hammock Beach Resort Green Team contributes to several other Flagler County charities. In November, the Green Team held a food drive for Flagler County residents where more than 250 items were collected. For additional high-resolution images of this donation, contact Kelli Robinson, public relations manager, at krobinson@salamanderhotels.com or (407) 361-5581. For more information about Hammock Beach Resort, please visit www.HammockBeach.com.